We are pleased to announce that on 22nd September building work commenced on the extension to Cygnet Hospital Harrow. 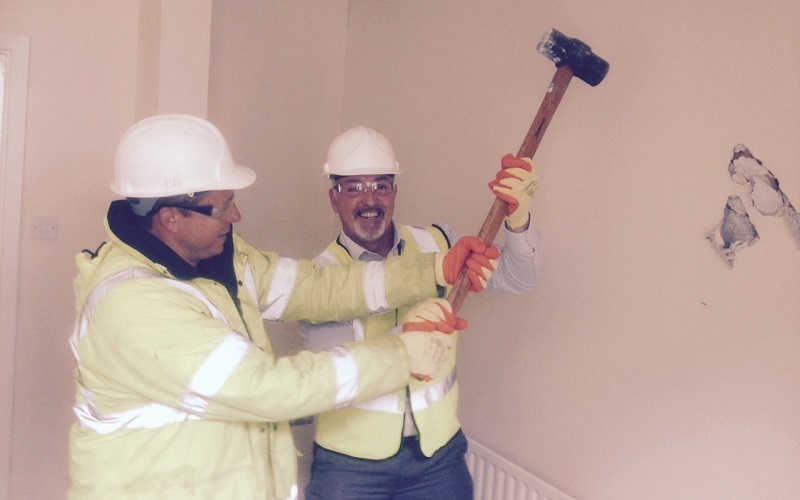 Hospital manager Seamus Quigley was given the honour of formally starting the works by knocking through one of the existing walls. The project will see the construction of a new ten bed service for men with ASD / LD, complementing the existing pathway on The Springs Unit and Springs Wing. In addition there will be significantly improved therapy and activity space for service users, and office space for staff. The hospital will be keeping a photo board of the building works and will soon be holding a competition amongst staff and service users to name the new ward. After his exploits with the hammer Seamus will also be given the task of laying the first brick. The building work will be carried out in a carefully phased series of works in order to ensure that the patient areas can be kept safely separated from construction activities. The works are expected to be completed by December 2017.